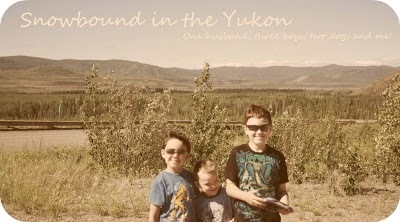 Snowbound in the Yukon: I wrote this days ago, so it's late in coming. I wrote this days ago, so it's late in coming. I started writing on Saturday and it was a terribly self-pitying post about me. What else is new? I was feeling so tired and haggard, it was just my emotions on overdrive. I didn't get much sleep Thursday night, Friday was super busy with it being Halloween. I took all 3 kids out with my brothers fiance and her son, while my husband stayed home and handed out the candy. We did about half the block when I decided to take Bubba back home, he was getting really cold. It was fairly warm out but I'd only put a fleece body suit on him and his costume thinking that would be warm enough but he wasn't running around like the other two, he was being pushed from house to house in the stroller. We then took the kids into town. Hit my brother's place and checked out the Haunted House after hitting two other houses on the way. The kids got scared at both places. My brother always goes all out. He scared the crap out of the kids at first unti they realized it was their uncle behind the mask. Then at the Haunted House, call kept saying it wasn't scary but we were only in the entrance area. When we went to the door and were going to go in, he didn't want to but he went anyway, somewhat wide eyed! They had fun. I was pretty exhausted by the time I got the kids in bed, my feet hurt and all I wanted was my bed. So I went to bed at the same time as the kids. Saturday, Hubby wanted to work at the shop so I let him and had the kids to myself all day. They fought a lot. I kicked them outside only one went and found friends, the other two napped. Still it was a long day. My cousin phoned and asked if we wanted this organ they were getting rid of. I said sure, so she and her husband dropped it off. It's not really loud, so I don't have a problem with it. We put it in the play room and the kids have been taking turns with it. So Sunday was pretty laid back, we cleaned the house, the kids played, I baked and cook, hubby did laundry. I napped. Yes, I did. I told Hubby on Saturday that I need a break and I was going to take one on Sunday. So I wrote a bit, read a bit and then napped. Hubby brought Bubba in a little while later to sleep as well. So I got a lot of sleep this weekend, we changed the clocks yesterday as well and because of my nap yesterday I couldn't get to sleep until 11:30, almost midnight. Well, Bubba woke and wanted to go to my bed but I made him stay in his room. He didn't like that one bit. I stood by his bed for about 20 minutes just putting him back into his bed and reassuring him that I was there. He was crying and I'd never heard him cry like this, it just broke my heart but I just can't get a good nights sleep with him in my bed anymore. He did come at about 4am with that same new cry and I cuddled with him. I was up at 6am today. My kids are increasingly getting on my last nerve with their attitude. They don't help with getting ready and I know that I've taught them well in this department but lately I can't get them to move it when we need to move it. I've tried starting earlier in the day, getting them out of bed sooner and to no avail. Stubborn! I wonder where they get that! Bubba is going through the pulling off his diaper and clothes phase and he's still in the climb up on everything phase. Loves getting into everything and looking at books and he's just so tall now and a little man. My mom gave him a hair cut last week and he looks so much older now. I keep reading but sometimes don't know what to say, so I say nothing!! I don't know what to say now except, 'hang in there'!! It will all pass. Kids grow up and we grow older then we wish we had it all back again! !